'Women of the Wall' members reportedly caught sneaking Torah scrolls wrapped around their bodies into Western Wall plaza. 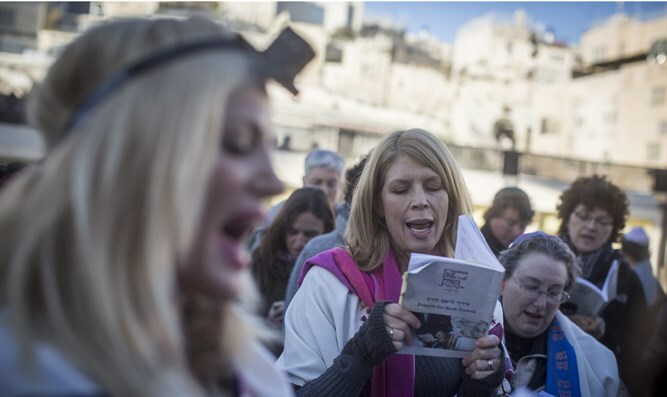 Members of the ‘Women of the Wall’ group, which holds non-traditional prayer services at the Western Wall plaza once a month, drew harsh criticism Wednesday after several activists were reported as attempting to sneak Torah scrolls into the plaza. For years, the Women of the Wall have demanded they be allowed to hold alternative, non-traditional services. Four years ago, Israel built an area allotted for mixed gender prayer and for the Reform and Conservative movements to pray as they wish, but the Women of the Wall insist they should be allowed to pray their way in the main Plaza.. Despite the backlash from both male and female worshippers at the Western Wall, who say the alternative services are a breach of the status quo at the holy site, the Women of the Wall smuggle in Torah scrolls for their monthly gatherings, in violation of rulings by the Rabbi of the Western Wall area. While in the past, Women of the Wall activists have attempted to smuggle the scrolls in duffle bags, allegedly using IDF soldiers among others to sneak the items past plaza security checks, on Wednesday, guards at the entrance to the plaza found activists had concealed Torah scrolls underneath their clothes. Following the revelation, Rabbi Shmuel Rabinovitch, Rabbi of the Western Wall area, blasted the group, calling the smuggling attempt “a desecration”. Women of the Wall deny such an incident ever happened. Women of the Wall responded, "The Kotel Rabbi is better off thinking less about what’s under women’s clothes, and more about what’s in their minds. Women of the Wall want to pray respectfully according to their custom in the women’s section. The Kotel Rabbi prevents them from doing what every boy and man are allowed to do in the men’s section. He incites his staff against Women of the Wall worshipers and supports, both openly and secretly, women and girls who whistle and shriek against Women of the Wall prayer. Rabbi Rabinovitch represents an extreme minority in Israel and it’s time we take back the keys to the holiest site for Jewish men and women." Earlier this month, a Google employee was fired for claiming that biological differences between men and women exist in both mind and general tendencies.